Image: Zach, Lexi, and Julian stand ready to paint with professional graffiti artist Dan Wenn. Photos: author. 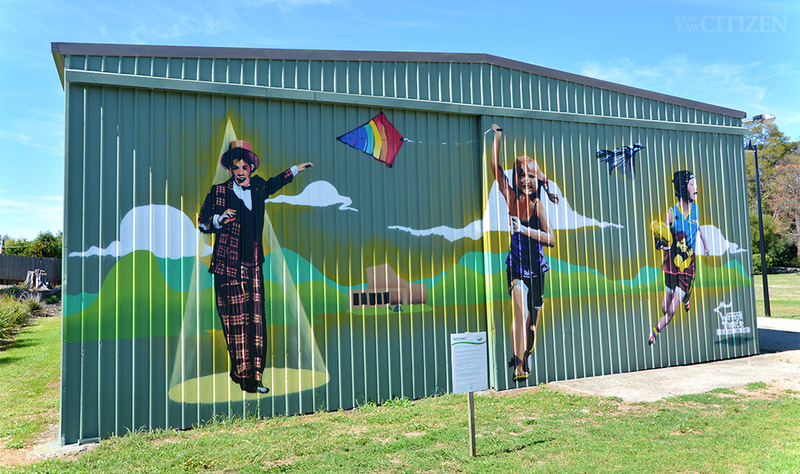 Eastern Park’s Green Shed might need a new name thanks to the artistic efforts of local kids. First published in the 8 December 2017 edition of the Baw Baw Citizen. Online version updated with additional images from 17 January 2018. A large mural of, by, and for the people has been painted on the exterior of Warragul Theatre Company’s Eastern Park building. The week-long Green Shed repaint project is scheduled to wrap up today. 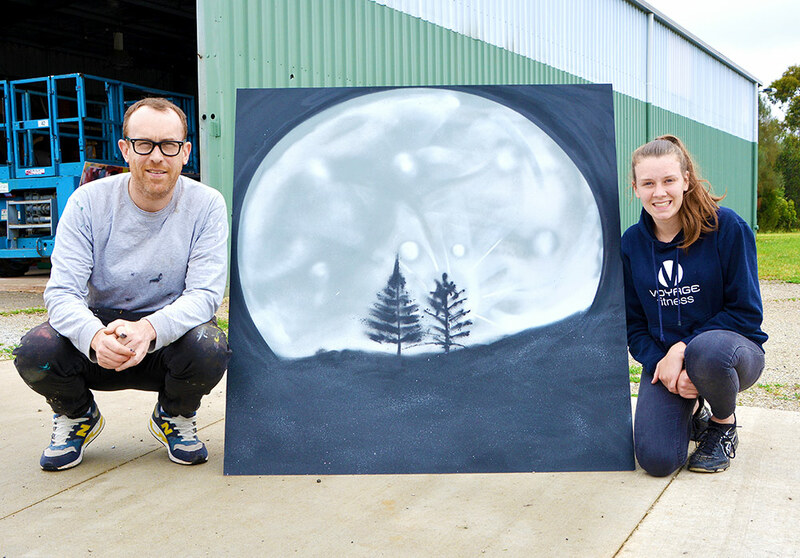 Led by Port Melbourne-based graffiti artist Dan Wenn and backed by the Baw Baw Shire Council, it has brought 10 local youth along for the ride and given them the chance to learn and try out new artistic skills. 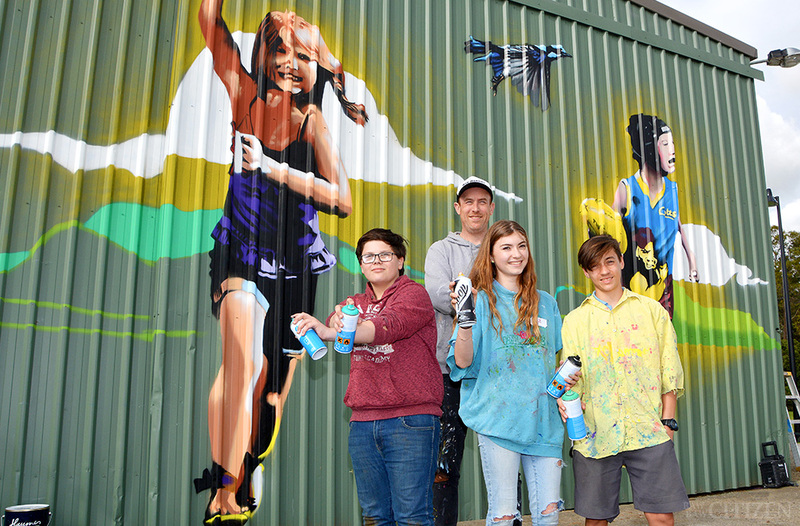 “We wanted the guys involved in the workshop to carry their skills through and be a part of the mural,” Dan told the Baw Baw Citizen on Tuesday. Eastern Park is a busy hub which several community groups call home; from the theatre company and community garden to the Warragul Colts football club. “We were given a brief by the council to create something that was for all the user groups in the area,” Dan said. The young participants were trained on the basics of spray paint at a workshop on Saturday, during which everyone created their own works. Having learned the ropes, they were able to contribute to the main mural during the week. Image: Dan with Georgia Bransgrove and the artwork she produced at Saturday’s workshop. While open to people aged 14 to 25, Dan said it was mostly younger people who wanted to be involved. “It’s amazing with the young kids, first of all how easily they pick it up, but also how quickly they fall in love with it, put their head down, and commit to doing it. It’s really good,” he said. One of those young people is 14-year-old Zach, who has been exploring a few different art techniques in recent years. “It’s a great opportunity to do something like this, and it’s really fun,” Zach told the Baw Baw Citizen. “It is helping a lot, and I have been thinking about doing a lot of art in the future. “I have courses on it [planned for] next year. Image: the shed on 17 January 2018. We also spoke to Lexi and her brother Julian. “I love art. My mum’s an artist. I’m really into this sort of stuff,” Lexi said. “We learned all the basic skills for this [on Saturday], and then we could help with the actual mural if we wanted to. Her brother started out less excited. “I went to the workshop. I didn’t really want to do it but went anyway, and now I’m really enjoying it,” Julian said. Part of the reason for that turnaround might be Dan. “He’s really good,” Julian said. Dan said he’d like to see a few more of Baw Baw’s plain walls coloured in, and that the community seems up to it. “Why have a blank wall? We can have community involvement and do some really cool stuff that would suit the area. 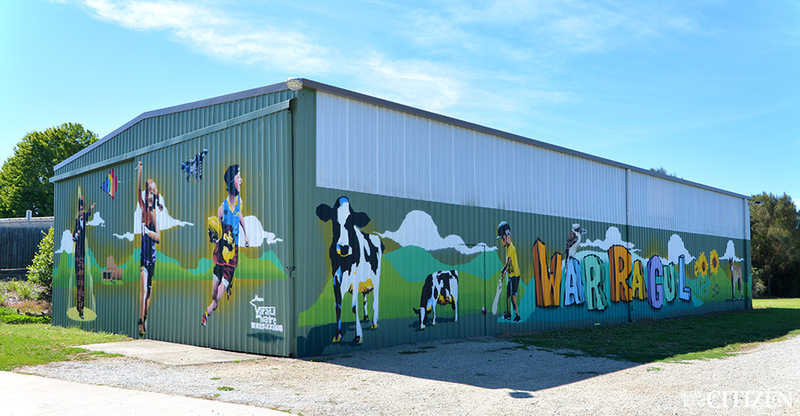 If you want to check out the new Eastern Park mural, you can find the shed near Warragul Community House, 138 Normanby Street, Warragul.